Welcome to a week of PlayStation Vita updates! Ubisoft has announced its campaign to inform the world of their upcoming launch titles, the first being Dungeon Hunters: Alliance. Over the next week, Ubisoft will be profiling our upcoming portfolio of launch titles for the PlayStation Vita. All these titles will be available a week prior to launch, giving gamers the opportunity to build up their library prior to the launch of this highly anticipated PlayStation handheld or experience the games early if you are picking up the First Edition bundle on February 15th. Exploration fantasy is what Dungeon Hunter: Alliance is all about. 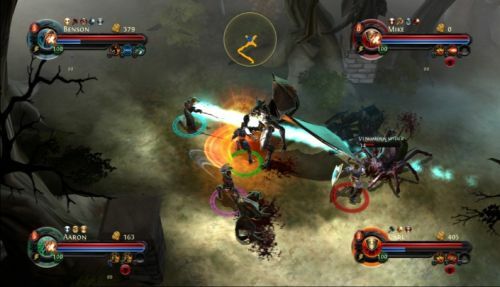 Whether you’re teaming up with friends, slaying monsters, leveling up your characters, collecting items, etc., Dungeon Hunter: Alliance is aiming to make its mark on the action/dungeon crawler experience (and to put all the haters to shame).The PlayStation Vita will also hold full backward capabilities with PlayStation Portable games, touch screen controls, and Bluetooth/Wi-Fi/3G capabilities, providing some of the best online co-op experiences on any portable system to date. Even better, Dungeon Hunter: Alliance is aiming to take full advantage of it. So far, you and up to 4 players can team up over Wi-Fi to satisfy your dungeon crawling needs. Just remember, however, that the difficulty level will change according to the number of players in your party (this won’t stop you at all, I’m sure). Dungeon Hunter: Alliance, so far, is set to release with a retail value of $39.99 on February 14th, but it can already be purchased on the PlayStation Network for only $15. We aren't completely sure if the $25 difference is made up by the "exclusive content" the game is supposed to house, but we of Co-Optimus will be keeping a close eye on this as we come closer to the launch date. While the PlayStation Vita won’t ship until February 22nd of this year, keep your eyes peeled on PlayStation Vita’s blog for more upcoming titles that will undoubtedly keep our impatient gamer hands itching to play them. Page created in 0.4522 seconds.